Sunroof, Heated Mirrors, Bluetooth, Back Up Sensors! Compare at $20485 - Our Price is just $19888! A superlative interior and a very large trunk space are the two high points of this modern and refined sedan. 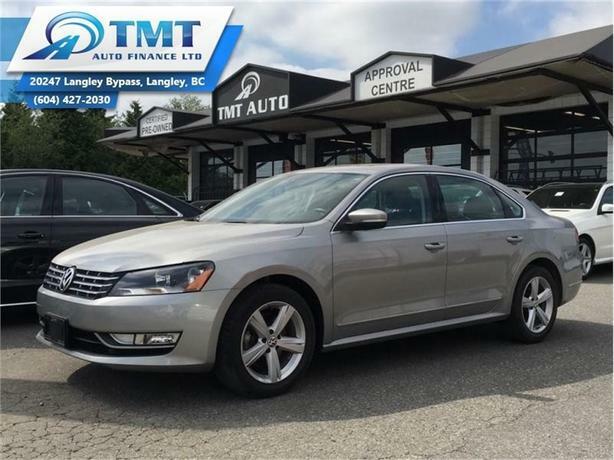 This 2014 Volkswagen Passat is for sale today in Langley. One of the more interesting options for a midsize sedan is the 2014 Volkswagen Passat. It's the only European car in the family sedan segment, and that heritage is evident in its clean styling, tidy, down-to-business interior design and solid, composed highway ride.This sedan has 52162 kms. It's gray in colour and is completely accident free based on the CarProof Report. It has an automatic transmission and is powered by a 140HP 2.0L 4 Cylinder Engine. This vehicle has been upgraded with the following features: Sunroof, Heated Mirrors, Bluetooth, Back Up Sensors. It may have some remaining factory warranty, please check with dealer for details.